Vancouver, BC – February 20, 2013 – Hitcase, creator of waterproof, rugged sports activity products for iPhone, announces the SuckR, a tough marine-grade suction mount for in-vehicle use on the road or the water. The SuckR mount attaches to any smooth, flat, non-porous surface including windshields, windows and two-way mirrors. With two ball joints and a single tightening clamp in the socket arm, the mount’s axles can be loosened simultaneously to seize any viewing angle in seconds. The SuckR mount pairs perfectly with Hitcase and Hitcase Pro, waterproof, shockproof cases that transform the iPhone into a mountable, ruggedized POV camera. The SuckR mount makes it easy to capture real-time video during any adventure. Just position your Hitcase or Hitcase Pro where you want it, then tighten down the giant wing nut, and it all locks into place instantly. Whether you own the iPhone 4/4s or iPhone 5, Hitcase’s patented Railslide™ system lets you quickly attach your Hitcase to the SuckR mount, delivering maximum flexibility and compatibility. 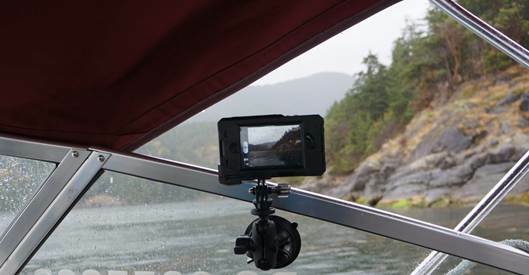 No mount could be simpler to stick to the windshield of your boat, car or other vehicle before taking off, while eliminating the shaky video associated with hand-held filming. As Hitcase continues to revolutionize the way iPhones are used in action sports, expect to see more additions to this great line of products created by adventurers who understand the need to relive every heart-racing moment. Hitcase Prois a waterproof, shockproof case that revolutionizes the way you use your iPhone. It includes a built-in, removable wide angle lens for capturing professional quality photos and videos, and doubles the effective field of view of your iPhone’s camera. A patented-pending ShockSeal design protects your phone from the elements while shielding it from shocks and drops, so you can adventure with confidence. The Hitcase Pro’s Railslide system makes it super easy to mount the case to just about anything with its auto-locking functionality and one-button trigger release. Hitcase’s free Vidometer app overlays your speed, altitude and G-Force on your videos so your friends know it really went down that way. 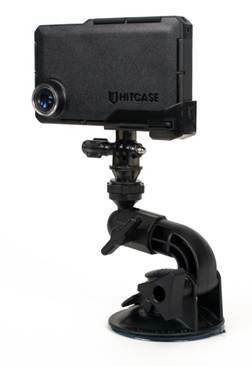 The SuckR mount is now available for $49.99 at www.hitcase.com. Hitcase Corp. is a Vancouver- based company focused on building leading edge products for the mobile market. For more information on Hitcase visit www.hitcase.com or http://www.facebook.com/Hitcase. Download Hitcase’s free iPhone action video app Vidometer.